Performers include: Christopher Egan, Tom Wisdom, Carl Beukes, Alan Dale, Roxanne McKee, Anthony Head, Luke Allen-Gale, Shivani Ghai, and Rosalind Halstead. This supernatural drama is set in the near future, some 25 years after “The Extinction War” — when an army of lower angels, assembled by the archangel Gabriel, waged war against mankind. The archangel Michael, turning against his own kind, chose to side with humanity. Rising out of the ashes of this long battle are newly fortified cities which protect human survivors. The city of Vega is a glistening empire that has been formed from the ruins of what was once Las Vegas. Two houses vie for control and the stage is set for political upheaval and a dangerous power shift. Abandoned by his father at a young age, Alex Lannon (Christopher Egan) became a soldier. He rose through the ranks to join the Archangel Corps — an elite unit responsible for the protection of Vega’s aristocracy. Through his assignment to House Riesen, Alex developed a secret relationship with Claire, daughter of the Lord of the City. Often rebellious, Alex tries to balance his sense of duty with his need for freedom. A legendary warrior throughout history, the Archangel Michael (Tom Wisdom) was the only angel to take humanity’s side during the Extermination War and turned against his own kind. Michael has watched over Alex his entire life, but is just now beginning to understand the complexities of having such a close relationship with humans. Michael’s scornful and jealous brother is the Archangel Gabriel (Carl Beukes) — the leader of the angels in the war against humanity. Though a more colorful personality than Michael, Gabriel is full of hate for mankind and wants nothing less than to wipe them out entirely. General Riesen (Alan Dale) led humanity in the Extermination War twenty-five years ago, and today leads the city of Vega as Lord of the City. A paragon of strength and duty, Riesen helped build Vega, and imposed a class system as a way to keep order and ensure the city’s survival. His daughter is Claire Riesen (Roxanne McKee) and she’s next in line for her father’s position as Lord of the City. She is beloved by the people and always does her best to watch out for the city’s lower classes — despite her sheltered and privileged upbringing. Although she is in love with Alex, Claire is torn when her father insists that the only way to help the city move past the caste system she hates so much is to marry William Whele. As the Secretary of Commerce, David Whele (Anthony Head) is the chief administrator of Vega and the second most powerful leader in the city. A ruthless and cunning political operator, this ambitious man is always on the hunt to keep or grow his power — by any means necessary. His son is William Whele (Luke Allen-Gale), Vega’s Principate. Specifically, he’s the religious leader of the Church of The Savior, the religion that has grown since the Extermination War all based around the concept of “The Chosen One.” Kind hearted to his flock, he is very much in love with Claire and welcomes their betrothal — even if he admits it is a political move by their fathers. Arika (Shivani Ghai) is a diplomat from Helena, one of the other cities which have risen in the aftermath of the war. She’s also the beautiful and wily wife of that city’s Queen Evelyn. She arrives in Vega as part of a negotiating party. A stranger in a strange land, she shares a clandestine relationship with David Whele. As one of General Riesen’s consuls in the Senate, Becca Thorn (Rosalind Halstead) is one of the city’s most powerful leaders and oversees all scientific and medical personnel in the city. She acts as confidant to General Riesen and is a close friend to Claire. Becca carries on a forbidden affair with Michael — one that involves stronger feelings than even she may be comfortable with. AAs the Chosen One, it turns out that Alex can evict 8-Balls from an entire invading horde. Everyone is thrilled an impressed – especially Claire – but the celebration is short because General Riesen, who is newly a Dyad named Duma and who is working for Gabriel, is rolling into town with Gabriel’s army. Gabriel, meanwhile, has taken Michael to Mallory, Alabama, where they bump into that Prophet of Lucifer’s, the dude in the cowboy get up. These two have been through a lot, and they ask the Prophet to heal Gabriel, and this leads us through a pretty big series of flashbacks. Long ago, when the apocalypse started, Gabriel and Noma were in cahoots to kill Alex – but Noma couldn’t do it. Back in Mallory, Michael confesses to Gabriel about the death of Lucifer all those years ago. Yes, he died, but Michael never destroyed his remains. Meanwhile, General Riesen/Duma, rolls into town and tells the people of Vega to bring him the head of Alex or he’ll kill them all. As Arika and David reunite and decide to flee to Helena together, Arika catches up with Claire and asks that they all go. Alex tells Claire she has to go because she’s important. And Claire agrees – psyche! – she gets herself captured and taken to her dad’s control room so that she can kill him before Alex would have to. And now she’s face to face with the murderous angel named Duma who lives in the body of her dear old dad. As Claire argues with Duma, he takes her weapon. Then Duma switches back to the General and the Riesens share a touching reunion. It’s a confusing state of things for the Riesens. Alex arrives with guns blazing, and then the General switches back to Duma and holds Claire hostage, while he monologues for enough time for the General to take over the body again. When Claire shoots Duma (and her dad! )…Duma shoots Claire! And then Noma shoots Duma! And then…holy smokes! Claire dies! As Arika flies off to Helena with her doctor and a child, David Whele is captured and brought before Duma. Yes, we’d just seen Duma get shot and fall out a window, but here he is – alive and well. Meanwhile, Michael demands that Lucifer’s keeper A.K.A. The Prophet ask for healing powers to save Gabriel from the darkness, uh…Lucifer’s keeper sets Gabriel on fire, which heals him. This leads to questions being raised about Noma’s loyalty—to anyone. See, Noma was on Gabriel’s side until she couldn’t kill Alex as a baby. And then she was on Michael’s side. Lucifer’s Prophet seems to suggest that she might have joined forces with another angel. But who? What do you think? Do you like the Dominion TV series? Do you think it should have been cancelled or renewed for a third season? 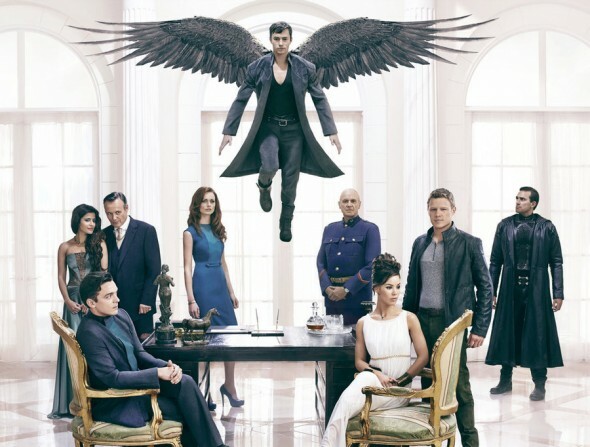 I think, dominion season #3 should have to renewed completed with indonesian subtitle. I love this series and many others too in indonesia. Give us a lovely imagination about humanity description for love, belove, anger, and sacrifice. Really, it should have to RENEWED. I’ll wait for it. I would like to see Dominion renewed . I miss not seeing an ending. I believe in angels anyway. Bring it back. I discovered Dominion a few months ago, I think it’s a great story and I absolutely hate that it didn’t get to finishing the story. I would love to see how this story played out with no closure given. We need a 3rd season, or a TV special. I miss my Thursdays with Dominion. I gave up on SyFy when they cancelled this show. Viewers desetved a 3rd season. Every time I invest my time in a SyFy show it gets cancelled. Just left hanging. They could of brought it too a new time slot. From 10 to 9 pm. Promote it more. But the channel just threw the jewel away. I really wish someone would pick it up. I definitely don’t think it should have been cancelled. It was a great story and the cast of characters was intriguing. Please bring it back to finish the story. would love to see it back. Really enjoyed it and would like to see more episodes. No!!! This a great show!! I would like for it to stay on !!! Have watched from the beginning. loved the show sad to see it go.